To make Vanilla Ice, iconic Skunk, potent Northern Lights and a classic Afghani gave their excellent genetics, resulting in an incredibly productive new indica hybrid. Add her reliable growth and the superb Vanilla flavour and we dare to say that she may well become a favourite for cannabis enthusiasts everywhere. Zambeza more than surpassed their goal to make an outstanding indica hybrid when they took a Skunk, Northern Lights and an Afghani and crossed these three great strains for their latest creation. The name of Vanilla Ice may possibly give you a hint, not only does she have an amazing flavour but the “Ice” of course stands for her frosty, sparkling resin-coated buds that make Vanilla Ice not only an incredibly beautiful plant to look at but one that impresses with crazy resin production, making her a perfect plant for hash and extracts. You can grow Vanilla Ice indoors or outdoors. Indoors, she will normally reach a height of 60-90cm which makes her suitable even if space is an issue, bringing yields of 550-650g/m² to the grower’s table. Outdoors, Vanilla Ice can reach up to 200cm when conditions are ideal and this is where she can yield 550g of some frosty prime bud goodness per plant. While her yields are certainly very good she may not be the highest yielding strain out there, but it’s important to consider that she flowers in a very short 55 days, adding to her outstanding productivity. Smoking Vanilla Ice by Zambeza won’t leave a doubt about her excellent genetics. She shines with a rather unique taste and blends sweet aromas with the unmistakable flavour of fresh vanilla, making for a mouth-watering experience that connoisseurs no doubt will love. With 17% of THC, she is still potent enough to give you a very relaxing body stone that comes with a pleasant feeling of focus and clarity as well. 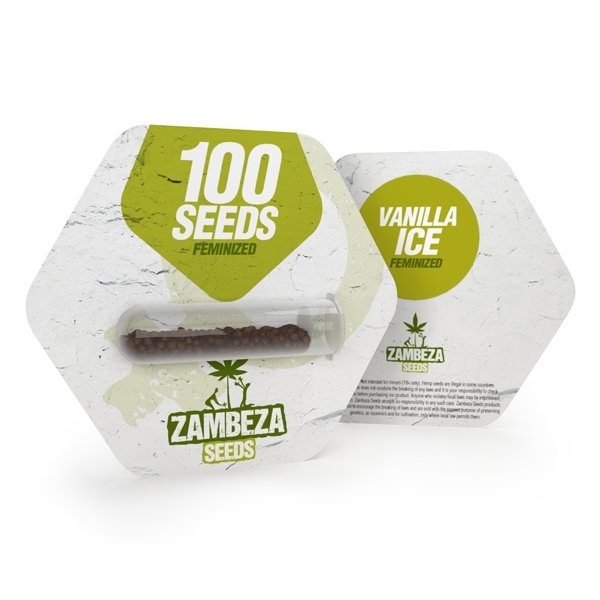 Looking at Vanilla Ice bulk seeds by Zambeza you will definitely have a hard time to find faults because frankly, she hasn’t any. This is an easy-growing, reliable indica that thanks to her production, yields, awesome taste and pleasant high, combines the best of some of the best indicas which makes her absolutely worth growing. Vanilla Ice bulk seeds are offered in packs of 100 seeds each, ideal for those who require bigger quantities of some first-rate indica seeds.